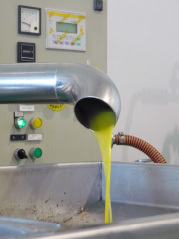 The phenolic content of olive oils varies according to the olive type, climatic conditions in the producing area, when the olives are harvested and how ripe they are when picked. Oil production and storage methods also have an influence. The definite reason that moved us to design an enriched olive oil for cosmetic purposes was that it has been proofed that there is a synergistic effect: the power of the phenols combined in olive oil is superior than that showed by the components separately (11, 12). The olive tree is a natural source of phenols (antioxidants), but since these are very polar particles (hydrosoluble) the vast majority do not end up in olive oil but are wasted. With our technology we recover those natural phenols and use them to enrich oil. As a result of our exclusive process, we obtain a cosmetic formula containing only natural ingredients, with an extreamly low wax content that guarantees optimal absorbtion by the skin. And with an unsurpassed antioxidant power, that prevents free radical aging, while nourishing, moisturizing and regenerating the skin. A luxurious skin vitality effect. That is 10 times higher than Hydroxytyrosol. We introduce this innovative product to the Premium Facial Care cosmetic market at a key moment to seize the opportunities that different sectoral studies (Euromonitor, Marketline) have identified: a market looking for natural products, innovative technology and a real effect on the skin.